I lend my happiness into the pool of millions of others in this nation and around the world who sat back and clapped and cheered and cried and stood in witness to this historic event. Holy Daughter and Holy Son were so happy, they ran out onto the cul de sac, shouting Go Obama! Yah, Obama! We live in a mostly Democrat neighborhood on a mostly Democrat street but the great irony is that we weren't able to vote. So on behalf of this green cards-in-waiting family, thank you thank you to all who voted, any many for the first time. As a UU, it means a lot to know that we'll have a President in the White House who gets issues of inequality and social justice. Who sees beyond the blue and red and supposedly-divisive colors on the U.S. ma. More to the point, who sees beyond the U.S. map, period. I am ecstatic, as any Canadian in the U.S. would be, to know that change is immiment in January. I've been staring at my neighbor's Impeach Bush window sign for more than a year and I can't help but wonder, as I saw it again this morning, what the reaction in the White House was. Blink and miss the news - I had to go searching for it. Apparently, President Bush passed election day quietly. As he has much of this term as President, as well. He gave a public statement this morning that was magnamious in spirit. It will be an interesting time ahead to see how he rides off into the Texas sunset as the most unpopular President recent history has ever known. But I so can't wait to see Barack, Michelle, their daughters and their new puppy cross the threshold into The White House. It really will be the dawn of a new era in U.S. politics. I don't envy him the work and challenges ahead of him. I worry for his safety but I wish him godspeed and every success. He's campaigned hard yet made it all seem effortless. For this alone, he should be applauded. Happier days are here on the horizon, if only because the psyche in the nation has lightened. It has been exactly 7 years, 1 month and 24 days since I last felt so compelled to park myself in front of CNN News and not move. Today, on E-Day, D-Day, V-Day or B-Day - a label which changes invariably depending on one's slant - I shall revisit that feeling. It's a similar one, minus the shock. I feel emotional yet guilty for feeling as though I own such a personal stake in all this. I feel helpless if more than a little fearful but most especially, I feel far and away removed from this election process, just as I felt miles apart and worlds away on 9/11 from Ground Zero. And yet, then as now, I am amazed at the epic show of patriotism that continues to sweep this nation, despite disastrous evidence to the contrary from the powers or lack thereof that be. Everything this country purports to stand for, including its symbol, its tattered and torn flag ~ which has been veritably dragged through international mud these past two administrations ~ has been tried and tested. But still Americans rally God Bless America without missing a beat, and I confess: I stand on the edge of the crowd with a baffled if bemused and respectful look on my face. God really does bless America with a patriotic pride unmatched elsewhere. It's incredible really. History books will surely pay testament to this sentiment, how ever misguided it might seem to us foreigners at the best and worst of times. Equally incredible is that this epic campaign ~ which is assuredly the longest, most expensive, painful and drawn-out affair I have ever bore witness to (said the outsider on the inside with her nose pressed against the window looking out whilst viewing her reflection from within) ~ is that it entailed little mud-slinging of GWB, and nowhere in this process was there ever a battle cry for impeachment or electoral college reform. That, to me, is seems like a rather grand hoodwink. So much money pissed down the promotional drain, and for what? Pomp and circumstance. It's been that kinda year of feeling betwixt and between. We weren't able to vote in the Canadian federal election this year, on account of being ex-pats. Nor are we able to vote in the U.S. federal election, on account of being aliens. A legal tax-paying kind, mind you, but an alien and an immigrant and a foreigner nonetheless. So we stand on that patch of soil between two countries, singing This Land is Your Land, This Land is My Land with equal conviction in both languages and accents - Canadian and American - yet unable to really stand up, be counted and assert our say. Early indicators point to an Obama Victory. I'd like to hang my hat on that hook, really I would, but I was quite sure Gore had won in 2000. And, of course, he did ~ in more ways than one. Pathetic Presidency or Prized Pulitzer - there's really no contest, is there? I can't believe Republicans dare to still rally around their dysfunctional political party and have the audacity to believe this country needs yet a third term fear-based ideology, domestic neglect, corporate nepotism, lobbyist greed, and war-mongering. It astounds me. If you keep doing what you've always done, you'll keep getting what you've always got. I remember thinking that exact thing when Bush got elected in. People politely watched Fahrenheit 9/11 in the penultimate days to the 2004 election, and yet still, they voted him back in. It would seem America got what it deserved, or so thoughteth this cynical and disillusioned Canadian, back in the day circa November 2004. But then a curious if ironic thing happened a few short months later in the spring of 2005. We decided to up and move to the UnUnited States of America. And I began to have a different take altogether and a sudden vested interest in American politics. Funny that, eh? Well, not really. My disillusionment and mistrust of Americanthink has not dissipated. 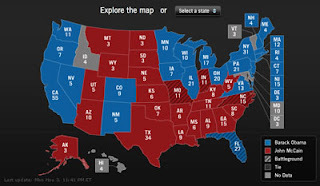 I see the map below and I'm astounded to see how red it is. And not just in red states. I encountered two serious Sarah Palin costume-clad gals on Friday who saw their costume not as mockery but as starstruck tribute. They like her, they really do! And so, I can't help but feel apprehensive today. I want to believe but maybe all this decade of doom, gloom and fear is beginning to rub off on me, too. I mentioned to Holy Hub last night that perhaps Obama's grandmother passing away on the eve of the election was a good thing. Maybe she's heading to heaven to sway the Big Kahuna. To which Holy Hub responded, "Yeah, well what if God is a Republican?" It was a horrible seed of a thought to plant in my brain just before nodding off. I slept with one eye open all night because when push comes to shove comes to hightailing out of Dodge, I'd hate to be part of the exodus alluded to below so soon after pulling up temporal roots here. patrols to stop the illegal immigration. hunt, pray, and agree with Bill O'Reilly. crossing their fields at night. Greenfield, whose acreage borders North Dakota. often wailing loudly that they fear retribution from conservatives. preparing them for the Rapture. suspicious about their age,' an official said. Canadian economy just can't support them,' an Ottawa resident said.